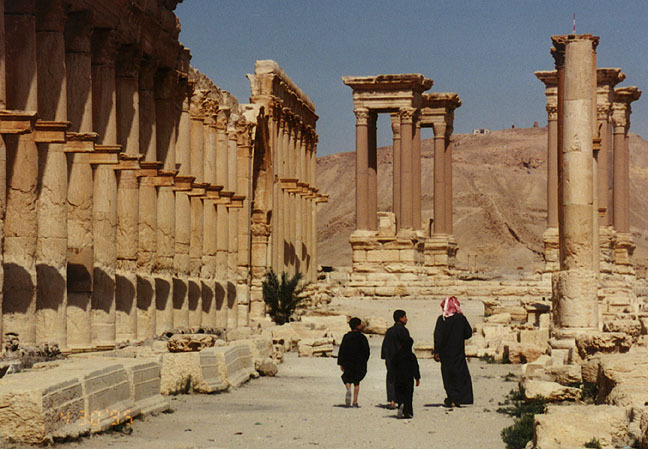 AMMAN: The Islamic State appears to be losing ground in Palmyra after launching a surprise attack last week, withdrawing from areas in the north and east of the historic town, home to Roman-era ruins that are a UNESCO World Heritage Site. “IS has pulled out from the northern neighborhoods in Palmyra, with life gradually returning to normal and some shops re-opening,” Khaled al-Homsi, the alias of a member of the Palmyra LCC, told Syria Direct Monday. “IS fighters have settled in the al-Maalaf and al-Amariya areas [north of Palmyra] and some of the groves in the southeast vicinity of Palmyra,” Homsi said. The Islamic State captured al-Amariya last week. Homs Governor Talal al-Barazi offered conflicting information, saying that regime forces had recaptured the village of al-Amiriya from the Islamic State in a phone interview with pro-regime daily Al-Watan Sunday. “The Islamic State terrorists have begun to pull out of the vicinity of the town from the eastern side,” said al-Barazi. It is unclear whether IS's withdrawal occurred because of losses incurred while fighting the regime or for tactical considerations. A view of Palmyra's ruins. Photo courtesy of bestourism. Last week, pro-IS Twitter accounts reported that Islamic State fighters had taken eastern sections of Palmyra [see here]. Pro-opposition Masar Press reported last Thursday that fighting was underway in the northern and eastern districts of the city. IS took the highest point in the Palmyra area, the site of a military radio/communication tower, last Wednesday, which the regime in turn heavily bombed on Thursday. Homs governor Barazi said regime forces took the tower back, but that information could not be confirmed. Umar Hamza, a civilian inside Palmyra, told Syria Direct last week that regime warplanes had struck the vicinity of the citadel twice “by mistake,” according to what he heard from soldiers stationed at checkpoints inside the town. Syrian army forces killed the leader of IS's assault on Palmyra, Abu Amir a-Shishani, reported Al-Alaam correspondent Hussein Mortada Sunday.